The beauty of house and pet sitting multiple times is that word gets out within your own personal network. Friends, family, and then their friends and family find out that you are willing to house or pet sit. And they start asking if you’re available! This sit was actually for a friend we’d met back in Roatan years earlier. She has since moved to Asturias, a region in Northern Spain filled with stunning mountainous landscape and bordered by the Bay of Biscay. When she and her partner booked several months of work projects around the world, they needed help caring for their smallholding. Enter: Friends who house sit! She reached out to gauge our interest, we chatted details, and we arranged it all while we were housesitting in London during the summer. Since this sit was not coordinated through TrustedHousesitters, we had to communicate much more openly about what she needed from us and how we would exchange our time and her home. With a website, the homeowner explains all of these details in the original post. Things like expectations for animal care, any gardening duties, and photos of the home and animals are all included in that original post – or, should be! With family and friends, sitters need to ensure they gather all of the important information up front so that everyone is on the same page. This includes everything from the home set-up to the animal requirements to emergency contacts and more. The best part of sitting for friends and family is the overlap! We got to spend a few weeks with our friends before they left on their longest overseas trip; this was such a lovely time for us all to catch up! That overlap also allowed us to get more familiar with their beautiful home and many animals. Since this was a long-term housesit, making sure we knew what to do in any potential situation was very important. Their home in Spain was a rental, which is another consideration when housesitting. You have to make sure the landlord or property manager knows you’re there and has your contact details. We would not take any sit where the pet owner tried to hide these facts. In case of any emergencies, the last thing you want to worry about is the confusion of who has a right to live in the home! Our friends’ landlord was around quite frequently, so we interacted with him a lot, and he had no problems with us being there at all. In fact, we even took over feeding his animals for him a few times! 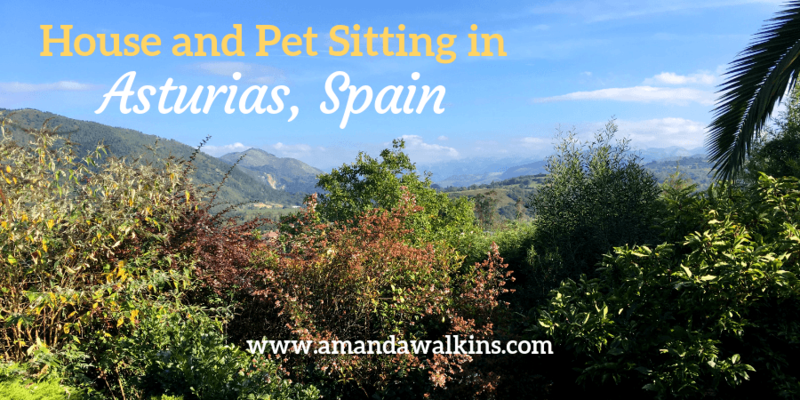 TrustedHousesitters actually has tons of house and pet sits listed in Spain, so we could have easily opted to go through our normal website to spend a few months housesitting in Spain. We just lucked out that we have friends in wonderful places around the world! I had lived in Spain temporarily before, spending four months in Bilbao in Basque Country. Asturias is just west of Basque Country, but similarly green, hilly, and gorgeous. These areas of Northern Spain also boast incredibly diverse cultures. Basque Country famously has its own unique language and talks of cessation are often present. Asturias was a central focus of the Spanish Civil War and suffered brutal retaliation after the ultimate defeat of the Republicans. History still lives in so many facets of daily life in Northern Spain, impacting today’s political and economic scene as much as the social and cultural. I adore Northern Spain – maybe it’s that rebellious spirit or maybe it’s the strong sense of pride in culture and heritage. Globalization has made so many places too similar, while Northern Spain retains its individuality so gracefully. It is rugged and beautiful, it is eclectic and interesting; the people are welcoming but brutally honest. And the wine…well, we all owe a great debt to Northern Spain for what they’ve gifted to the world! Longterm housesitting in Spain grants you the opportunity to feel like a local. You can delve into the culture and explore the region in an effort to better understand this marvel of a place. If you want to housesit to travel and to explore new places, countries like Spain offer a variety of opportunities paired with incredible diversity throughout the small nation. You could do housesits in Southern Spain and then make your way north in order to see the variety of geography and culture. You could explore the beaches and mountains or the cities and small villages. Yes, speaking some Spanish will make your experience all the richer, but you could probably get by in Southern Spain (where there are lots of expat Brits) and in the cities if you’re not quite confident in a foreign language. In Asturias, we found far fewer people spoke English (even in the cities), so having some basics would benefit you for a longer stay. If you’re going for a few days or a week, no worries at all! But, still, pleasantries go a long way so you should always try to learn some local lingo. We spent our three months of longterm housesitting in Spain in Asturias. The view from our kitchen window was of the Picos de Europa, the highest mountain range in Spain. These beauties offered us breathtaking vistas on the daily…which we gratefully accepted! The town of Arriondas is perfectly situated only a 7-minute walk from the house. When you aren’t familiar with an area before arrival, it’s hard to gauge exactly what your living situation might be. I was nervous that the town would be tiny and we would feel quite isolated for three months. On the contrary, Arriondas was big enough that we never made it to all the different restaurants and bars! And we did try, trust me. Dining and drinking out were amazingly affordable. We had no qualms about walking into town for a late-night dinner or for a midday beer by the river. But our main focus while in Spain was on the animals in our care…of which there were many! When we first chatted about coming to Spain, we knew we would have 2 goats and a bunch of chickens to look after. And then, a kitten showed up at the house! So, of course, the kitten became family and was also to be under our care. When we arrived, there were 2 goats, 1 kitten (aged around four months), and 26 chickens. By the time we left three months later, the 2 goats and kitten (though much bigger by then!) were still there, and we left 40 chickens behind! Our two goats were super cute and cuddly and just desperately wanted attention. That should really be all the highlighting you need to read, but there’s more! The chickens gave us fresh eggs every day, which we gratefully accepted. There’s something wonderful about knowing that the eggs you eat came from happy chickens in the field out back. You know what they ate, which feels good. And you know there was no additional packaging or transporting involved! It was just a collection from the coop and a crack over a pan on the stove. Magic! I also learned that, sometimes, you get a squishy egg. It had no shell! We did not eat this one, but we did increase the calcium options for our ladies, just in case! We were also lucky enough to be surrounded by loads of other farm animals near the house. The landlord owns sheep and a donkey named Pipo. Pipo desperately wanted our attention and love, so we happily obliged on a regular basis. Additionally, the landlord occasionally went away and asked us to feed the lot for him. There were probably about 15 sheep in the field plus Pipo. All of them were greedily hungry and loudly greeted us when we came with a bucket in hand. In fact, after the first time we fed them, they then assumed we always had food and swarmed us whenever we neared the gate. This wouldn’t have been an issue except that our vegetable patch was located within their field…so we had to open the gate and make our way through their swarm bleating and crying, until we could get into the veg patch and close that gate. Oh, and they ate a bunch of the vegetable patch, too, so that was no bueno. It was fenced off with barbed wire fencing, which obviously wasn’t enough of a deterrent when it comes to fresh veggies! We came out one day to find the butternut squash had been a typically late-night Spanish dinner. Tufts of wool and donkey fur along the wire showed us who was responsible. Although the tooth marks on the remaining squash would’ve also given them away. Alas, farm life! Animals will be animals and hanger gets the best of all of us! And to top off all the farm animals, our little kitten grew up into a gorgeous, and bizarrely human-like, cat! He slept anywhere and came on walks with the goats. He is easily the most laidback cat we’ve ever encountered anywhere in the world. If you want to do something like we did and spend a few months housesitting in Spain, you have plenty of options. TrustedHousesitters always has listings available throughout the country for varied lengths of time. Alternatively, you can do what we did! Reach out to your network to see who knows someone who knows someone who lives in Spain. That’s something we’ve learned: You never know if you never ask! By making it known what we want to do, we have been lucky enough to have incredible experiences and adventures. These include finding Lina, managing a dive shop, launching my freelance writing career, housesitting in Spain, and so much more! Sometimes, you just need to let the world know what you want and get the ball rolling. We are so lucky to have wonderful friends in many countries around the world. If and when those friends need a hand, they know they can ask us. We can’t do it all (we’ve had to turn down dog sits in New Jersey and in Nova Scotia for this year already), but we can try! Lucky for us, these dates and this location matched with what we could and wanted to do. We were so grateful that our friends trusted us to care for their beloved home and menagerie while they headed off to work around the world. This life is a damn good one; we are always appreciative for the opportunities we receive and the adventures we get to have. I hope you get to have the adventures you seek, whatever those may look like! Over the course of 2018, we spent about 4 months in Edinburgh with various housesits, about 3 months in London with back-to-back housesits, and then 3 months in Asturias with one long-term housesit. If you’re interested in house sitting and have questions, feel free to reach out any time! I’m always happy to help. I will also be speaking at the inaugural House and Pet Sitting Conference in England this September. If you are curious about this lifestyle and want to learn more, come join us!